Although based upon recollection, this very readable book provides some insight into life on the homefront in the South during the civil war. The author describes many of the ways they would try to replace scarce items by trying to make some of the items themselves. The author was not above relating the humor of some of their attempts to adapt to the situation and shortages. One of her memorable learning experiences was when she was determined to out-produce all the other ladies in spinning. However, she spun her thread so tight, though she could have exceeded any other person's production at normal twist, her twisting was so tight, it shortened her output to what everyone else had done. 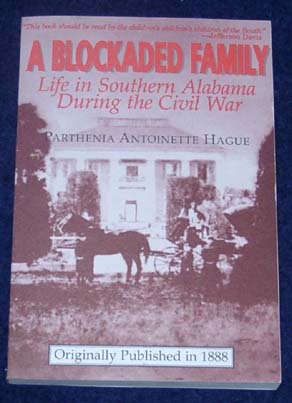 For anyone trying to replicate life in the South under the blockade, the book also provides many ideas of things to try. We can relate that we tried making sugar from watermelons. All we can say is, they must have had a lot of watermelons and firewood to cook the juice. We took an entire watermelon and, after boiling the juice down, wound up with a small quantity of syrup that was thick as molasses and had a background taste of cooked melon. Regardless of whether you try any of the activities yourself, this book is an invaluable reference for a Southern civilian impression and enlightening for all readers. As mentioned in the price list section, since it doesn't have one of its own, Virginia Mescher has prepared an index which is included in the purchase price.